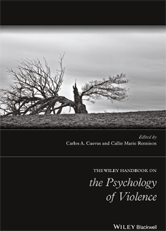 The Wiley Handbook on the Psychology of Violence presents a collection of original readings that explore all major aspects of the psychology of violence, aggression, and other criminal behaviors. Utilizing an interdisciplinary approach, readings are contributed by a diverse group of experts, including psychologists, criminologists, sociologists, and others. Expanding Role of Law Enforcement – Expanding Data? 3 Why are Offenders Victimized so Often? Can Educational Programs Prevent Partner Abuse Among College Students? Intimate Partner Violence – What Have Nearly Four Decades of Research Taught Us? How Many Youth are Affected by Online Harassment? Who are the Victims and Perpetrators of Online Harassment? What are the Implications for Prevention and Intervention based on What We Know?